On September 15, 1835, English naturalist Charles Darwin and the crew of the HMS Beagle arrived in the Galapagos Islands. 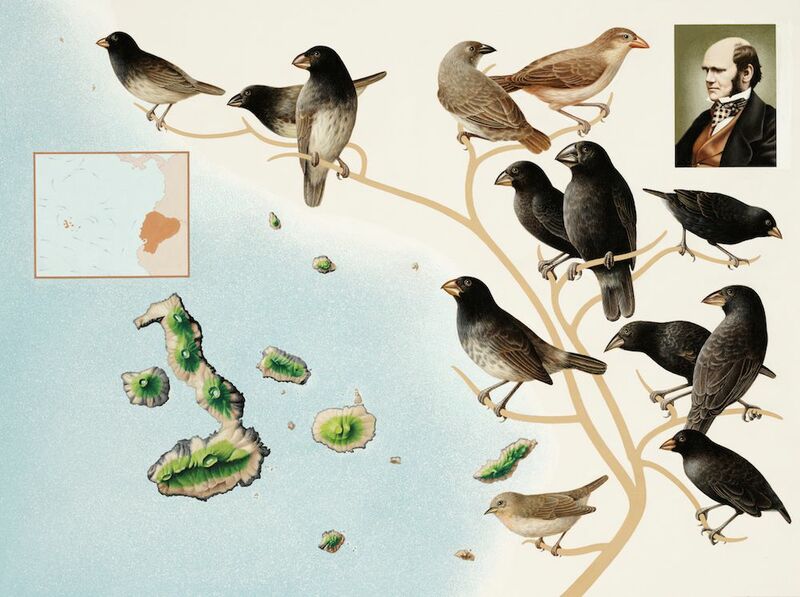 Charles Darwin used the finches of the Galapagos Islands as an example of speciation, a key element in his theory of natural selection. On September 15, 1835, English naturalist Charles Darwin and the crew of the HMS Beagle arrived in the Galapagos Islands. These volcanic islands are located west of Ecuador, along the Equator in the Pacific Ocean. Darwin traveled there as part of a five-year journey to study plants and animals along the coast of South America. Darwin collected and documented a dazzling array of species in the Galapagos. He studied these organisms when he returned home. Eventually, Darwin focused his study on his collection of finches, a species of small bird. The finches were very similar, but had beaks of different sizes and shapes. Darwin theorized that the beaks were adaptations that helped each species of finch eat a different type of food, such as seeds, fruits, or insects. Darwin’s study of the plants and animals of the Galapagos was integral to his theory of natural selection, a part of the larger process of evolution. process by which organisms that are better -adapted to their environments produce more offspring to transmit their genetic characteristics. to formulate and propose a group of ideas to explain a scientific question.